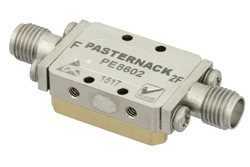 RF coaxial frequency multiplier (also referred to as a coaxial frequency doubler) PE8602 from Pasternack has SMA conectors and are 50 Ohm. Our SMA frequency multiplier is manufactured for a minimum frequency input of 4 GHz and a maximum frequency input of 9 GHz. This SMA microwave frequency multiplier / doubler output minimum frequency is 8 GHz and output maximum frequency of 18 GHz. 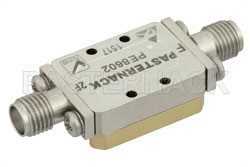 SMA frequency doubler / multiplier PE8602 from Pasternack is rated for a dBm P1dB and is just one part of over 40,000 RF, microwave and millimeter wave components from supplier Pasternack. This RF frequency multiplier with SMA connectors is in-stock; Pasternack is where to buy your radio frequency components for same day shipping throughout the United States and internationally, as with all other Pasternack RF parts.